This Illustrator tutorial provides an overview of the features added or enhanced in Illustrator CS5. 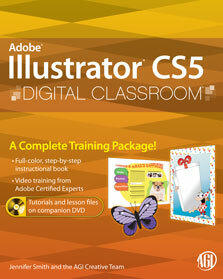 It is taken from the Adobe Illustrator CS5 Digital Classroom by Jennifer Smith. From the more prominent changes, such as the perspective grid tool and the new artboards panel to the subtle improvements in the workspace that make feature, Illustrator CS5 includes a number of changes that benefit users familiar with older versions of Adobe Illustrator. You will not be working with lesson files in this guide to new features, but feel more than welcome to experiment as you discover how you can do more with Adobe Illustrator CS5. It is still beneficial to have formal training in drawing when creating artwork in Adobe Illustrator, but now even amateurs have the opportunity to build realistic perspective illustrations. 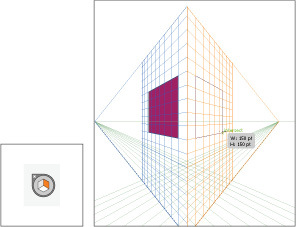 New to Illustrator CS5 is the Perspective Grid tool ( ) and all of the additional features that work with it. Using the new Perspective Grid tool, you can create illustrative scenes with 1, 2 and 3 point perspectives. 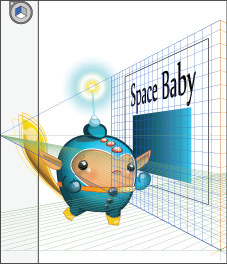 You can use the grid to create, scale and duplicate shapes on a perspective plane. Using the Perspective Grid feature. To use the Perspective Grid tool, select it from the Tools panel. When the Perspective Grid tool is selected the grid appears on the artboard. The active plane is highlighted in the Plane switching widget, which appears in the upper-left corner of the artboard. A. Plane switching widget. B. Horizon Height. C. Left Vanishing Point. D. Extent of Grid. E. Vertical Grid Extent. 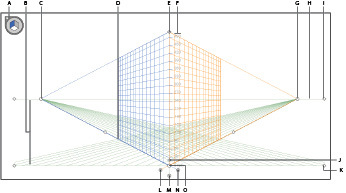 F. Perspective Grid Ruler. G. Right Vanishing Point. H. Horizon Line. I. Horizon Level. J. Grid Cell Size. K. Ground Level. L. Right Grid Plane Control. M. Horizontal Grid Plane Control. N. Left Grid Plane Control. O. Origin. Once you have selected the Perspective grid tool, you choose View > Perspective Grid > Define Grid to select whether you want to create artwork using 1, 2, or 3-point perspective. You can also narrow or widen the grid by decreasing or increasing the Viewing Angle. If you select a shape (such as the rectangle tool) and draw on the artboard, you’ll notice that the shape automatically attaches itself to an active perspective plane. You can change the active plane by clicking on the plane that you wish to be active in the widget in the upper-left corner of the artboard. Change the active plane by The next object drawn is now created on the selected plane. selecting it in the widget. If you want to create shapes that are not attached to a plane, click on the grey area that surrounds the widget. If you want to hide the Perspective Grid, choose View > Perspective > Hide Grid, or press Ctrl+Shift+I (Windows) or Command Shift+I (Mac OS). Select No Active Grid to draw normally. You can reposition an object on a grid, and even take an object and attach it to a grid, using the Perspective Selection tool. 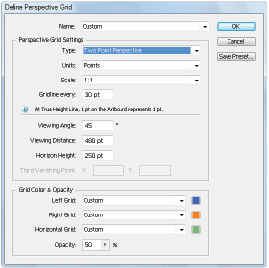 The Perspective Selection tool is the hidden tool in the Perspective Grid tool. To reposition a shape, simply select the Perspective Selection tool (click and hold on the Perspective Grid tool to select it) and then click and drag the shape(s) you wish to move. To attach a shape to a grid, select the grid you wish to attach the shape(s) to, and then click and drag, using the Perspective Shape tool. The shape is attached to the grid. It is easier than ever before to create interesting and unique shapes in Adobe Illustrator. With a click and drag you can add, intersect or delete one shape from another. Create the shapes that you wish to combine, overlap them where necessary and then select all of the shapes to be combined. Using the Shape Builder tool, click and drag through all of the shapes, from one end to another. Note that if you do not drag through an entire shape, some parts may not be combined correctly. Select multiple shapes. Click and drag with the Shape Builder tool. To delete one shape from another, simply hold down the Alt (Windows) or Option (Mac OS) key while clicking and dragging with the Shape Builder tool. Select multiple shapes. Hold down Alt/Option and click and drag. You can also separate shapes that overlap to create individual shapes. To divide shapes, select multiple shapes and click and drag only within the shape that you wish to divide from the original shape. The shape is then independent of its original shape and can be positioned independently. Select multiple shapes. Click and drag within the shape. Learn Illustrator with this Adobe Illustrator Tutorial based on the book written by AGI's Adobe Certified Instructors and used in AGI's Adobe Illustrator training classes. This Illustrator tutorial is provided free of charge for you to learn Illustrator on your own and to see the quality of the Illustrator book, Illustrator training, and Illustrator tutorials created by AGI. To learn Illustrator with the help of one of our expert instructors visit AGI's training website. If you are interested in buying this Illustrator training book you can buy it on-line at Amazon.com or at your favorite local book store. The team at AGI hopes that you find this Adobe Illustrator tutorial a useful way to learn Illustrator. Copyright 2012 by American Graphics Institute (AGI). No content on this site may be saved, stored, reproduced, or used without the express written consent of AGI. For information on licensing this content, contact AGI at info (at) agitraining.com or visit AGI for Online Illustrator Classes, Illustrator Classes in New York, Illustrator Classes in Boston, and Illustrator Classes in Philadelphia.